Having spent a few weeks in the summer scouring Brittany for great sausages I left disappointed. 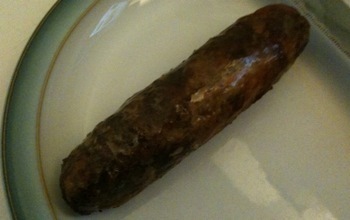 Despite the French being the Gastronomic Kings of the World I felt the sausages were seriously lacking. Had I had more time I would have headed South to Toulouse to sample the Toulouse sausages at their source. However, I have it on good authority that Matt Cockin at The FruitPig Company does it better than the French and I can see why people think that. These are beautiful sausages. A taste revelation non-the-less. And, very importantly they are 98% yes 98% rare breed meat! This means they taste amazing but it does make them a little less photogenic as they have 0% filler and so may appear slightly drier! You can really taste the rare breed pork and bacon and the garlic and pepper. The cloves and ginger really come through too and then on the end you get a cayenne pepper flavour. Top quality sausages! I wouldn’t disagree not only is the flavour absolutely spot on they also have that meaty bite I so often long for. “This is a first. 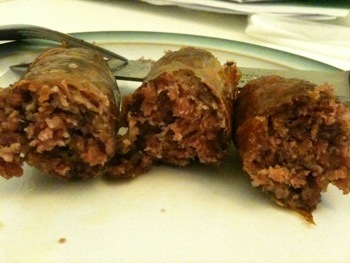 A final word on the Fruitpig Company’s fabulous Rare Breed Toulouse sausages. If you want to imagine how these beauties taste, then imagine the finest, highest quality deli in the whole of Southern France, take a slice of that deli, and mince it up in a blender. Next, grab hold of the World’s Champion Pig 2010 from the World Pig Championships, take the best bits of meat from that pig, and mince them up in a blender. Add some zesty, spicy garlic that you’ve lovingly grown on your allotment. Mix them all together and squeeze into sausages. There you have it. Where do we go from here indeed. I think I might have a new favourite dinner banger? As regular readers will know I also love The FruitPig Company because they are a “proper” family business. In-between his studies and rugby Ben, Matt’s son, butchers up a whole side of pork while, in Ben’s words, his Dad talks on the phone! Matt’s wife does the books and as this sausage proves, keeping it in the family really does work! “La saucisse Toulouse ici, c’est formidable! Je l’aime, elle est incroyable!